Klas’ Voyager 819 module is a modularised version of Cisco ISR 819 which can be installed in the Klas range of baseband systems. 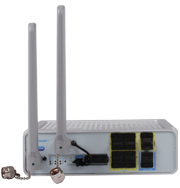 Cisco 819HG is a hardened device which provides 3, 3.5 and 3.7G cellular transport based on a Cisco IoS platform. Both GSM/UMTS and CDMA technologies are supported in addition to 802.11a/b/g/n. The device also has sync/async serial WAN support for IP radio connection and ISDN.